The Residences at Marina Gate. 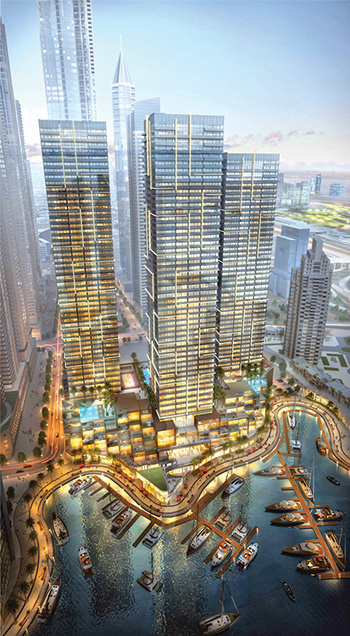 Piling and shoring has been completed and substructure construction work has started on the first tower at The Residences at Marina Gate project in Dubai, UAE, according to project developer Select Group. 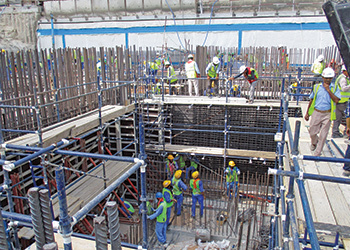 Meanwhile, piling and shoring work is nearing completion on the second of the three-tower complex at the entrance of Dubai Marina. “We awarded a contract worth Dh1 billion ($272 million) to ALEC for constructing the first two phases of The Residences at Marina Gate,” Rahail Aslam, CEO of Select Group, tells Gulf Construction. The first tower is due for completion in 2017, the second in 2018 and the final tower is scheduled for handover in 2019. Some 95 per cent of the built-up space in the mixed-use project is residential with the balance being retail offering. Upon completion, the beautifully crafted residential towers will have about 1,400 homes ranging from studios to three-bedroom apartments, exclusive podium-level duplex villas with waterfront views, and superlative invitation-only half- and full-floor penthouses. The development, spread over a staggering 3.8 million sq ft, features a common podium with connected walkways for more than 50 retail outlets including a supermarket, gym, salons and sports facilities located on the ground and mezzanine levels. Retail outlets at the promenade level will add a new dimension to the lively restaurant scene which Dubai Marina is famous for. With over 1,500 resident and 500 visitor parking spots, this development has been conceptualised with unrivalled attention to detail. The iconic podium level will feature villas coupled with tree-lined communal spaces and infinity pools that will immerse residents in soothing nature-inspired surroundings. Residents will be served by an array of amenities including a spectacular dual-level gymnasium overlooking the marina, championship-level, illuminated squash and paddle tennis courts, nine high-speed elevators with a dedicated service elevator in each tower along with a direct access loading dock for hassle-free moving in. Piling and shoring on the second tower ... complete. Select Group took a holistic approach while conceptualising its flagship project with the needs and desires of residents having been kept paramount. “In this needs-based approach, the building is designed from the inside out, and from the ground up,” says Aslam. All residential units have been created to maximise the views, with higher-than-usual ceilings and full-height glass window walls. The apartments have been planned with rooms that encourage creative interior design whilst avoiding odd corners and unusable space. “We went through a rigorous selection process before partnering with world-renowned Aedas architects. The concept for The Residences at Marina Gate was studied in many various forms, heights and scales to ensure that the mix of the heavier and solid villas at the lower levels complemented the lightweight transparency of the apartment towers above the podium. “The towers themselves are the most prominent part of the design, being seen from the surroundings and changing from a simple, elegant glazed elevation in daylight to a transparent element emphasised with perforated metal horizontal and vertical fins which emit a subtle diffused light. The scale and positioning of these on the facades convey and emphasis the proportion of the towers, suggesting verticality dissipating as they reach higher, further away from the solid base,” he says. The buildings use glass where possible to maintain the lightweight. On the façade of the podium entrance, this is maintained to ground level to break up the solidity of the podium. A textured paint finish will be applied on the concrete around the podium villas while a bronze expanded mesh will clad the facades of the car-parking areas and form the fins. “This was specifically chosen for the way the light dissipates and diffuses and it also provides the overall project colour scheme in a suggestive manner through the use of light and reflectance while keeping the majority of the facades neutral for glass colour,” Aslam explains. The three towers ... spectacular. Tower One comprises a ground level, a mezzanine level plus 51 (G+M+51) floors; the second tower is a 64-storey structure (G+M+64); while the third tower has 55 levels (G+M+55), giving the towers heights of 202 m, 262 m and 235 m, respectively. In terms of gross floor area, the first tower covers around 63,670 sq m, the second 74,350 sq m and the third 72,370 sq m.
Tower One will have parking for 637 vehicles, the second will offer 764 spaces and the third will have space for 676 cars. The luxurious retail offering in the development spreads over 50,000 sq ft. In addition to food and beverage outlets, convenience stores and salons, there are also potential plans for a daycare centre and a clinic. Aslam further says: “What makes this project unique is the location. 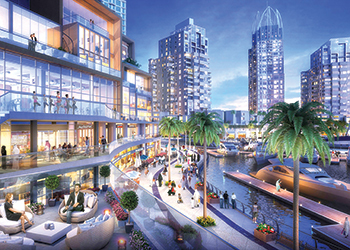 Situated at the gateway to the world’s largest man-made marina, the development will be surrounded by beautiful waterside views during day and spectacular cityscape views at night. He say the sold-out status of the first two phases of the project in a relatively flat market is a testament to the success of The Residences at Marina Gate. “The third phase of the project is set for launch in Q4 of this year and registered interest from the existing investors is at an all-time high,” he says. Select Group is an award-winning, real estate development and investment company with an asset portfolio spread over multiple jurisdictions and verticals. With development at its core which includes residential, commercial, and mixed-use ventures, the group has interests expanding to hospitality and investments within the real estate industry whether it is acquisitions of projects or prime land bank. Since its inception in 2002, Select Group has delivered some of Dubai’s most sought-after projects including Bay Central Towers, West Avenue, Botanica and The Torch in the Dubai Marina and the award-winning Nottingham One in the UK, to name a few. Over the years, Select Group has delivered 5.5 million sq ft of development (3,000 homes) with a further 3,200 homes currently in various stages of development across the Middle East and Europe. Project handover is expected in 2019. 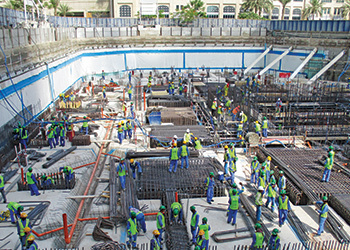 “We have a proven track record of delivery with a strong development pipeline. With expertise in development, redevelopment and regeneration, Select Group has an internationally diversified portfolio. Focused towards a value investing approach, the group seeks out assets where it can leverage its core skillset to accelerate value and increase net income production. InterContinental and Radisson Blu are two of the prestigious hospitality brands that form part of the group’s investment portfolio. The company has launched 10 landmark developments to date out of which eight have been delivered and the remaining two are under development, according to Aslam. Select Group has further diversified its investments into the hospitality sector with the launch of its purpose-built, 328-key InterContinental Dubai Marina in Q2 2015. This follows the acquisition of Radisson Blu Birmingham last year. In addition, the group is pursuing a strategy of acquiring European assets and presenting them to the GCC customer base which, considering the current exchange rates, makes for an attractive investment opportunity. Commenting on the market, Aslam says: “Dubai is one of the world’s most exciting emerging property markets and has registered strong growth in recent times. We believe in Dubai and are confident of its bright future and our continued investment strategy reflects this confidence.